May this season of hope, joy and love bring with it a renewed sense of gratitude. 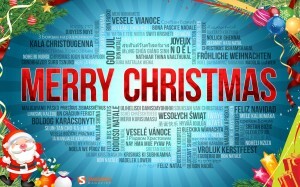 Wishing you and your families, friends and close ones a very Merry Christmas. Career pathing is more than a process used by an employee to move their career laterally, or enabling access to promotions and / or transfers between departments. It is in fact the building of career goals, skills and making choices that will accelerate their careers. May this season of hope, joy and love bring with it a renewed sense of gratitude. 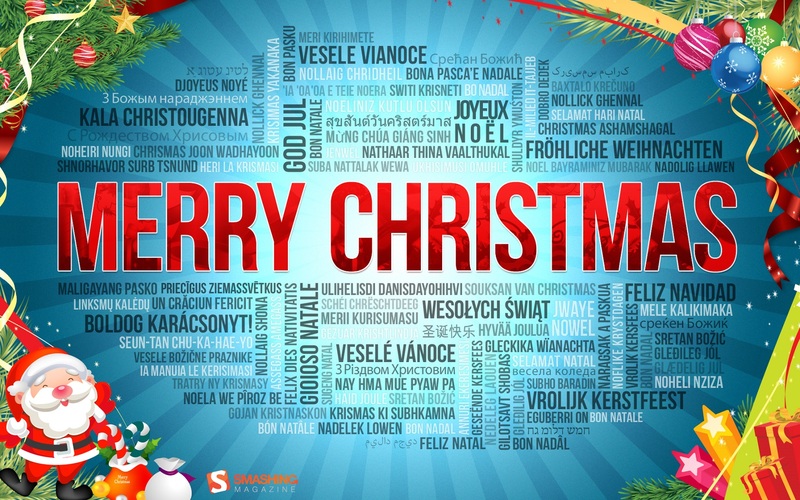 Wishing you and your families, friends and close ones a very Merry Christmas. Over the last few years I have focused on creating a career path. In HR we often talk about succession planning, pay for performance and set expectations as to goals and objectives. All these aspects have profound impacts on those who we aid in achieving their goals. In the future as the demographics change it becomes even more important to find these high potentials who have consistently stepped up in order to advance their professional careers. It was only natural that I envision career-pathing as an essential component of my life-long career management. Career pathing is more than a process used by an employee to move their career laterally, or enabling access to promotions and / or transfers between departments. It is in fact the building of career goals, skills and making choices that will accelerate their careers. I’ve always had an ambitious streak in me, and a thirst for knowledge – this lends itself well to really taking an honest look into what is required for career growth. The plan was to lay out what it means to be successful in my role, and build on the deficiencies in the various competencies which would be required to take me to the next level. A wise professor during my undergraduate degree once said to me: “Isn’t it funny how the harder we work, the luckier we get”. The statement still has a resonating impact on me which drives and motivates me to work harder. Starting my career as a Human Resources Specialist, moving to a Human Resources Generalist Role, advancing to a management capacity and then being granted the promotion to a Directors role had to have some luck involved with it. But is it luck, determination, hard work, training or the sheer concept of being at the right place at the right time? I think a bit of all – but training for me has been the primary driver of attaining the required skill sets in being successful at the roles I’ve occupied. The next step in my career path is to attain a Senior Human Resources Professional designation. Some say it is only a matter of time, and once I have the years of service, I’ll be able to clearly defend the experience basis behind the requirements. This may be true, but for someone as hungry for knowledge as me it is simply not enough. The challenge then becomes creating opportunities for exposure to these strategic factors which will propel my experience further in a shorter period of time. 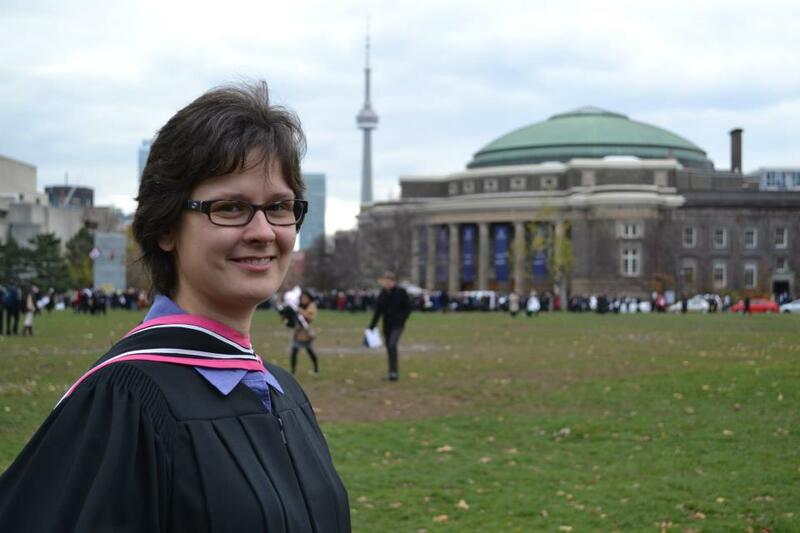 The SHRP is a designation given by the HRPA, and such I am determined to use their Career GPS and the competencies to ensure the basis of my background is founded in a strong foundational base for all areas of HR specializations. It all began with a Masters’ Degree in Human Resources Management and Industrial Relations as a way to distinguish myself further from my peers – training will define where it all ends. Happy Earth Hour to all who will be doing their part in ensuring we stay mindful of our plant. It’s sad to say that it’s been so long since my last post… the site has definitely been neglected for quite some time. “Neglected but certainly not forgotten”. In the midst of school, work, and various other projects the page fell by the way-side. As such this got me thinking about priorities… How do we set them? How do we define what matters most? Why is it that so often when under pressure or when time is at a premium we avoid one aspect of our responsibilities and focus on perhaps a less important factor giving it priority? In turn – how does this translate to our success at work and what drives us to achieve results? Priorities are set in many ways. Many individuals think of it as a time management tool in which we try and set and organize as much as we can in the little time we have left after our most important responsibilities are taken care of. Recently, I became a facilitator of Franklin Coveys – 5 Choices to Extraordinary Productivity. The ability to uncover and distinguish between time wasters and things that actually provide a return on investment in all aspects of my life lead me to think about what percentage of time was being spent on each function. After all, I couldn’t go teach a program that had such fundamental capacity to lead individuals to better productivity, I had to try it myself. Now, I’m not saying that it is a science that I have perfected. Refraining from sorting gravel, the little things in life, is not an easy task. However it has become a front of mind concept which helps me plan, establish priorities and act on the important rather than the urgent. As part of this new way of thinking I’ve decided to be more diligent in managing myself so that others don’t have to. In managing myself, I’ll be better able to manage the actions I take daily, weekly, monthly and keep focused on the choices that move me forward in my objectives, personally, professionally and socially. 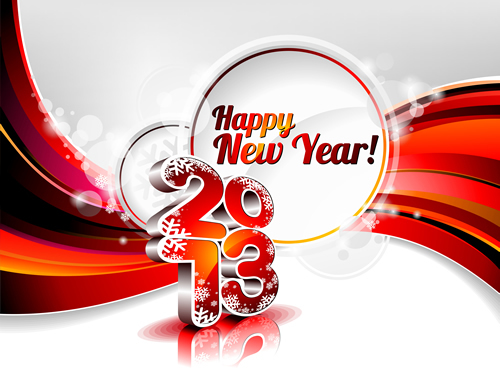 Therefore, 2013 should be a year which will lead to an increased amount of posts on this site. The framework for this resolution will revolve around the simple concept of “I‘ve committed to that, I can‘t do anything else but that.” I’m hoping that my readers will keep me accountable – One Post per Month! Wishing all of you a great New Year, filled with joy, memories and many accomplishments. 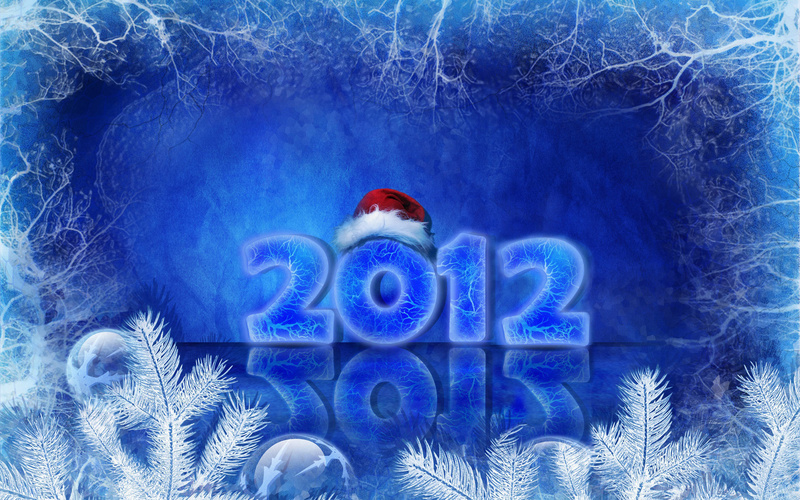 Thank you to all who have visited my site throught the 2012 year despite there not being a lot of updates. This year, my resolution will be to post some more information and engage in more thought provoking blogs. Companies need to understand their employees as well as they understand their customers to design an environment that drives higher engagement and performance. When applying the above five key principles and looking at the Employee Engagement survey it is clear that Human Resources and IR practices are put to the test. It is no wonder that the keywords “employee engagement” yields over 2 million hits on the World Wide Web, while many of the employee engagement books become best sellers. [ii] Utilizing Positive Organizational Scholarship (POS) organizations can elevate processes and outcomes within the organization. POS is defined as the study of that which is positive, flourishing and life-giving in organizations. [iii] Positive Organizational Behaviour studies have convincingly shown that positive organizational phenomena can make a unique contribution to explaining variance in organizational outcomes over and above negative ones. It also accommodates for why differences in engagement among employees exist. Positive organizational behaviour will also foster the perceived organizational and supervisor support systems and allow the organization to use their knowledge in furthering encouragement, support and appreciation while staying away from negative disapproval cynicism and sarcasm. Creating a positive culture then becomes a fundamental aspect in engaging employees. Actively increasing processes that increase positivity, starting meetings with praise, and noting last weeks’ accomplishments and achievements will create a climate of hope and good humour. In conclusion, it is easy to see a correlation between the many theoretical models, employee engagement and growth and productivity within organizations; however there also exists a distinction between job and organization engagement. Since engagement is described as a fulfilling positive work-related experience is tied to good health and positive work affect (Sonnentag, 2003)[iv] Competence, autonomy and relatedness which are also depicted within the antecedents and social exchange theories lead to enduring sustainable motivation which can be re-created to engage more employees within organizations. 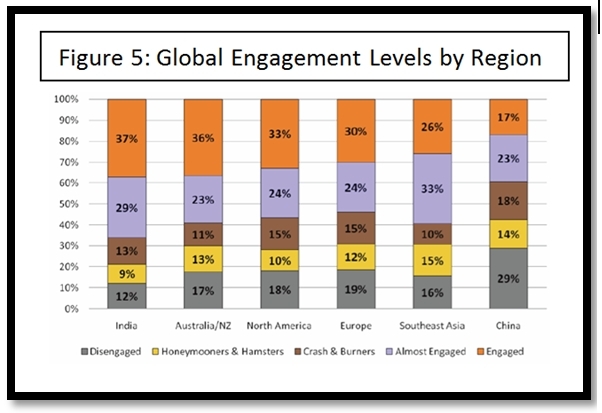 As seen in the Employee Engagement Report, 2011[v]g lobal findings help us articulate the most common drivers of engagement tying back to theoretical research. Its core finding shows; “Engagement starts with leaders, their self-efficacy, and individual self-determination which then drives or diminishes an organizations performance. When both parties abide by the exchange rules, the result will be a more trusting, loyal relationship with favourable reciprocal exchanges. As institutions change, organizations adopt new processes and Human resources management practices move towards high-performance work systems displaying more flexibility, greater use of training programs and tailored incentive compensation processes. These factors will once again challenge what we know about employee engagement and how organizations utilize it to strike a balance between employee happiness and organizational profits. Organizations must build a culture that fuels engagement. To earn the commitment of the workforce one must focus on meaningful work and mutual success. It is not enough to have an annual survey and annual planning exercises, engagement needs to be driven on a daily and hourly basis. [i] Towers Perrin 2007-2008 Global Workforce Study. The Fundamental Element Required to Grow in this Business Environment is People – energy, ingenuity and engagement of your workforce. [ii] Bakker, A. B & Schaufeli W.B(2008). Positive Organizational Behaviour: Engaged Employees in flourishing organizations. John Wiley & Sons Ltd.
[iii] Cameron, K.S. Dutton J. Quinn R (Eds) (2003). Positive Organizational Scholarship. San Francisco L Berret-Koehler. 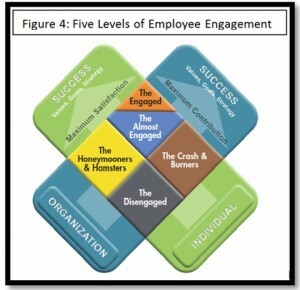 [v] Employee Engagement Report 2011, Beyond the numbers: A practical approach for individuals managers and executives. Blessingwhite research. The model is based on two neurophysiological systems of pleasure and activation. Bakker and Oerleman[ii] have position work engagement in the upper right quadrant of the model as it resembles high levels of pleasure and activation. 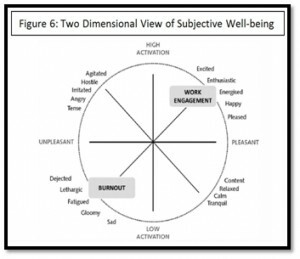 While burnout can be positioned in the lower left quadrant as it resembles low levels of pleasure and activation. This helps depict why we are able to divide employees into 5 different levels of engagement when conducting surveys. It also displays that there is a relationship between burnout and engagement. This model depicts engagement and burnout as two sides of the same, albeit imperfectly shaped coin. The implication is that in order to facilitate work engagement employers need to create an environment in which employees feel enthusiastic, energized, happy, and pleased because their jobs are both active and pleasant. If burnout represents the negative aspect of engagement, therefore one can stipulate that engagement has a dark side. Research focuses on an equilibrium and equity being built into the employer-employee dynamic whereby both employers and employees negotiate and perceive an appropriate balance. However, it is evident that engagement may foster greater demands, and work-family conflict. (Sonnentag, Binnewies & Mojza, 2010). Furthermore, if we apply the two dimensional view of subjective well-being may change not only on a daily basis but fluctuate on an hour by hour basis as it is heavily rooted in the emotional context of the individual. It is important to note that the results of any such engagement study is subject to being a snapshot in time and may present results that are only applicable to that particular situation rather than the entire organization. In order to truly achieve a genuine system of engagement employees and employers need to work together creating a positive, trusting, civil, respectful, and mutually beneficial working relationship, which leads to equity, opportunity and growth within the system. Some practical actions can be taken when trying to create energy, involvement and efficacy within the system, primarily they start with creating and communicating a clear vision that all employees will understand and create strong ties to the organization that bind. Wishing you all the blessings of the New Year…the warmth of home, the love of family and the company of good friends. Happy New Year to all. BlessingWhite’s current research shows that North America has approximately 33% of engaged employees. The variations are apparent across generations, and organizational function. Baby boomers are approximately 36% engaged whereas Gen Y and Millennials only account for 23% of engaged employees. Over 27% of the North American respondents indicated that opportunities to do what I do best, was a key engagement driver for them. Followed closely by career development opportunities and training at 20%. While job characteristics came in third, at 15%, asking for more control over how work gets done, flex time and telecommuting. The most important aspect to increasing contribution for employees had to do with increasing resources at 28%. In addition greater clarity about what the organizations needs the individuals to do and why tied with development opportunities and training at 16%. Despite North Americans having high engagement percentages, the number of respondents who intend on leaving the organization has doubled since 2008 from 7% to 13%. These results show that North American companies need focus on to improving their retention practices through employee engagement. 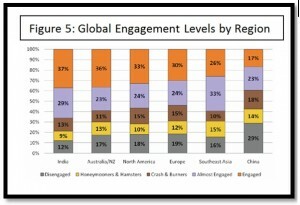 The overall 2011 survey suggests that engagement has risen to approximately 31%. The higher you go in an organization the more likely you are to be engaged. Despite this increase in engagement from the 2008 survey more employees are headed out the door. Only 61% of respondents worldwide they plan to remain with their organizations. As the report denotes cross-cultural differences in goals, values, and happiness as well as organizational processes exist, however, existing evidence also shows that human needs for autonomy, competence and relatedness are universal, they transcend culture and context. (Chirkov, Ryan, Kim and Kaplan, 2003; Vansteenkiste, Zhou, Lens and Soens, 2005). Therefore although some differences exist within the percentages of employee engagement each country studied depicts the effect of employee engagement as a factor in growth and productivity. The world around us changes constantly. Will we keep up?